I know that you cannot live on hope alone, but without it, life is not worth living. And You... And You... And You... Gotta give em hope. Thank You very much. I liked Gus Van Sant's ''Milk'' but I didn't love it. I just felt as if there was some barrier between myself and the subject matter, possibly the result of a number of dramatic contrivances that really took me out of the film, but also because I didn't really have much of a previous knowledge about Harvey Milk and his political career, and the film ended up leaving me a little bit unsure as to how he went from being a fairly uninteresting stock analyst to a political activist. None of these problems were present in The Times of Harvey Milk, an Oscar-winning documentary about Milk's life, his philosophy and his death. The documentary is a very respectful tribute to a man who clearly meant a tremendous amount to the people he knew and just as much, if not more, to the millions of gays and lesbians who saw him as a beacon of hope. Consisting of archive footage, talking head interviews with his friends and colleagues, some of whom were portrayed in Milk and which actually enriches that film since you realise how close some of the performances were to real life, and voiceover from Harvey Fierstein, it lays out in simple but effective terms who Harvey Milk was, how he got involved in politics and how he operated in the political arena, what he meant to the gay community but also, and this was something which I think Milk failed to get across, what he meant to people from other minorities and communities in San Francisco. For fear of this review falling into the same pitfalls I accused Milk of falling into, let's establish who Harvey Milk was. Harvey Milk was a gay activist who became the first openly gay elected official in U.S. history. He served for 11 months on the San Francisco board of district supervisors, in that time spearheaded a campaign against Proposition 6, a hateful doctrine that would have seen gay teachers, and their supporters, fired from schools for being gay, and, on November 27, 1978, he was assassinated, along with Mayor George Moscone, by Dan White, a supervisor who had resigned and who had been denied the opportunity to take back his position. He was 48. 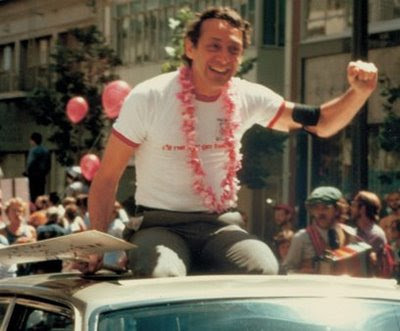 In this film, Harvey Milk emerges as a champion not only of gay causes, but also of those of ethnic minorities, the elderly, disabled people, anyone who he felt was not being represented. Even though the film runs the risk of portraying him as an opportunist, the interviews with Harvey show that he was an affable, passionate campaigner for whoever he felt needed to be campaigned for, it just so happened that he had a knack for media manipulation. The film’s portrayal of Dan White and his relationship with Harvey Milk is quite interesting since it seems oddly distant. He is vilified by the participants and much of the archive footage that is used, but the film-makers seem to want to keep an editorial neutrality to proceedings, lest their own feelings colour the work. It’s a decision that pays off in spades, though, as the anger of the interviewees becomes more powerful when the film just lets them talk and doesn’t try to impose itself upon the audience. I was also glad to see that there was no suggestion, as there was in Milk, that White may have been a repressed homosexual. It’s a psychologically interesting take, there’s no question of that, but the way in which Milk overtly stated it seemed like a cheap trick to me and one which edged Dan White dangerously close to caricature. Another thing that this film has over Milk (I feel somewhat bad poking holes in a film I like, but I couldn't watch this and not think of the other film on the same subject) is that it is manages to be panegyric without being soporific, which at times is what Milk winds up being. Having such a straight-forward, unfussy approach to its subject (there is almost no music used throughout and the style is very sedate and calm) gives it the feel of a beautiful eulogy rather than of someone wailing in sorrow at the pulpit. Finally, the film gets across, in Harvey's own words, what it was that he was fighting for and what his views on humanity were. It gives you a sense that he was a remarkable man who was funny, committed and who had a nearly endless compassion to those around him. It's a beautiful portrait that mixes the obvious sadness of the man's death with an optimism that suggests that his message and beliefs will never die.